NGC 5005 is a very massive spiral galaxy that is believed to have a supermassive black hole in its nucleus. 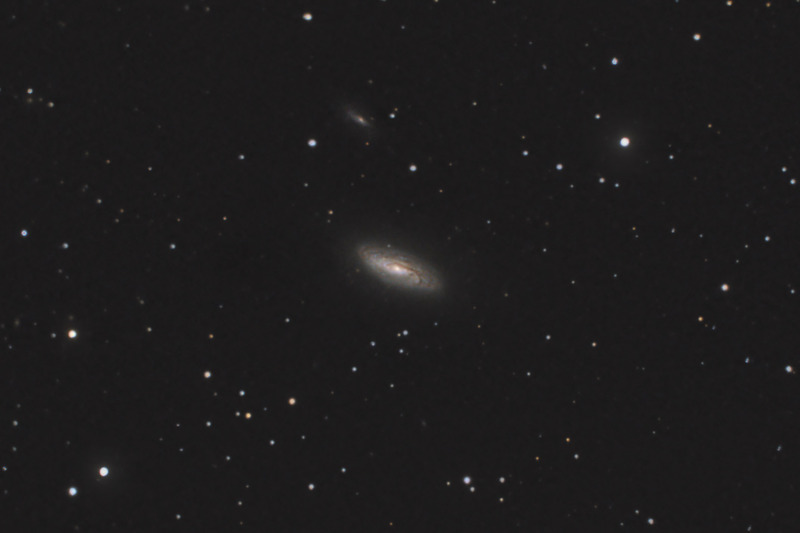 NGC 5005 is classified as a Seyfert galaxy due to its very active nucleus. Also shown in this image is IC 4211 - another spiral galaxy. Software Used Images Plus 4.0 for camera control, calibration, stacking, digital development, smoothing and Lucy-Richardson deconvolution. Photoshop CS5 used for color correction, levels and curves, high pass filter, star shrinking and saturation adjustments.. Carboni Actions for additional saturation adjustments, local contrast enhancement and noise reduction, Gradient Xterminator used for gradient removal, HLVG for green removal. Notes At the time I photographed this object, my telescope's collimation was not that good. As such, I didn't capture as much detail as I would have liked. I did a lot of processing to pull out as much detail as possible. While I was modestly successful, the additional processing left some noisy artifacts in the main galaxy.